The incredible turquoise waters of the Caicos Banks near South Caicos. Long Cay near South Caicos offers amazing water, secluded beaches, and the unique Turks and Caicos Rock Iguana. The quiet island of South Caicos is a spectacular destination for boat charters and water sports. There’s a wonderful selection of secluded beaches, uninhabited cays, snorkelling reefs, and mangrove estuaries to experience. The selection of charter companies on South Caicos is a bit limited when compared to what’s available on the tourism centre of Providenciales, yet there’s a good complement of local captains and charters that regularly visit from Providenciales. 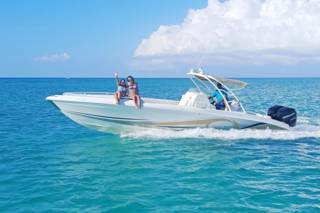 Due to the limited number of visitors to South Caicos there are no regularly scheduled shared cruises, and nearly all boat excursions are private charters. South Caicos is developing a great reputation for eco-tours – and for good reason. The mangrove wetlands and channel environments on the eastern half of the Turks and Caicos offer some of the best birdwatching in the country, with an unrivalled density of ospreys, frigatebirds, reddish egrets, and tri-coloured herons. Historical ruins on an uninhabited island near South Caicos. There’s a wealth of incredible beaches, cays, and sights surrounding South Caicos. The national park island of Long Cay is located a short boat ride away from Cockburn Harbour. The very long and narrow island offers an interesting and contrasting perspective between the deep blue water of the Turks Islands Passage and the shallow turquoise hues of the Caicos Banks. The western side of Long Cay hides many sheltered and beautiful white sand beaches, and the friendly Turks and Caicos Islands Rock Iguana can be seen climbing over the island’s bluffs. The west side of Long Cay is particularly beautiful due to its unique location. 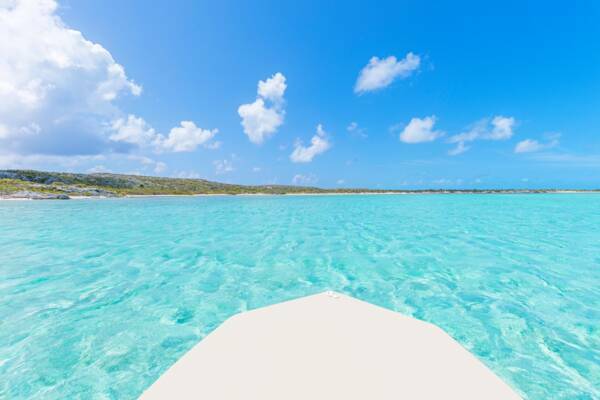 The proximity to the deep water off the eastern side of the Caicos Islands archipelago brings in crystal clear water, and the depth is shallow with a clear white sandy bottom, resulting in some of the most vibrant turquoise hues in the Turks and Caicos. Six Hills Cays is one of the more remote day trip destinations from South Caicos, yet is nevertheless highly scenic. This limestone ironshore island features crystal-clear ocean water, snorkelling reefs, and a few tiny beaches that can be found at low tide on the lee side of the cay. The isolated and expansive Hog Cay is located to the south of East Caicos, and is home to the hardy Caicos Islands donkey, and long forgotten sisal plantations. The island doesn’t offer much in the way of beaches, yet there’s great kayak and paddle board settings for the enthusiast. 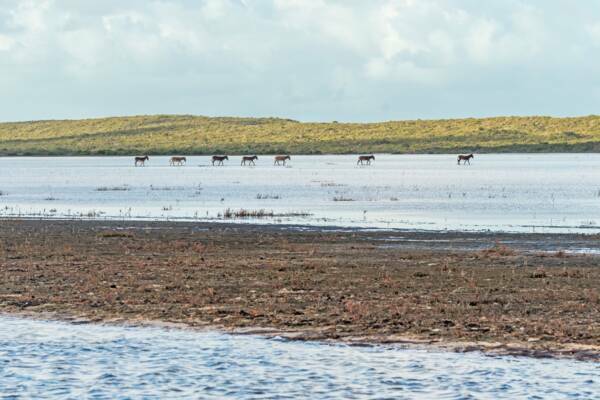 Donkeys in the wetlands near South Caicos. 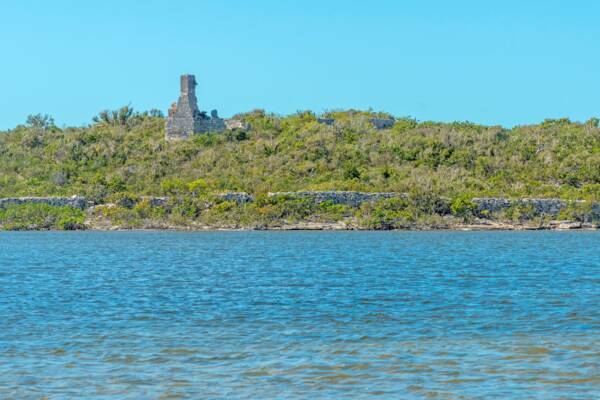 Boat charters from South Caicos can offer an incredible sights, ranging from marine lagoons to historical elements. The channel cays directly to the north of South Caicos, including Plandon Cay, Middle Creek Cay, and McCartney Cay, are highly scenic. Significant tidal water movement from the Caicos Banks is funnelled between these island, and with it a spectrum of marine life. It’s common to spot everything from sharks and large barracuda, to turtles, stingrays, eagle rays, conch, lobster, and fish. Some of the most spectacular ocean colours in the Turks and Caicos can be seen in this region, with colours ranging from vibrant turquoise, to blues, azures, and topazes. There are also many sandy shallows and channel sand bars, white create perfect white sand beaches against a backdrop of turquoise. Middleton Cay is another small and uninhabited island that’s located near the settlement of Cockburn Harbour on South Caicos. In addition to beautiful water and a small yet interesting beach, this 12 acre (4.9 hectares) cay is home to giant piles of conch shells, left by fisherman over the centuries. South Caicos is the commercial fishing capital of the Turks and Caicos, and is likewise excellent for sport fishing. Bonefishing is the most popular type of recreational fishing at South Caicos, and the shallow flats and sound to the west of the island rival the best salt water flat fishing sites in the world. Reef and bottom fishing, which is the primary type of fishing that has driven the local economy for generations, is likewise great, with common catches including several varieties of snapper and grouper, jacks, barracuda, and cero. As the incredible scuba diving and fishing can attest to, snorkelling is great around South Caicos, and the best reefs are best accessed by boat. Several of the local long time fisherman on South Caicos now run small scale tour businesses, with custom boat excursions, fishing, and snorkelling trips to the best spots around the island. For deep sea sport fishing in the water of the Turks Islands Passage, Sea Spice offers private fishing adventures. Due to the limited number of charter businesses on South Caicos, it’s advisable to reserve well in advance of your intended visit to ensure availability. The island’s resorts are often happy to arrange excursions for their guests, which makes the booking process much easier.